Nicky Clinch’s food first caught my eye when I visited Tiosk on Broadway Market and since then I’ve kept my eye on her to learn more about her work, her food. 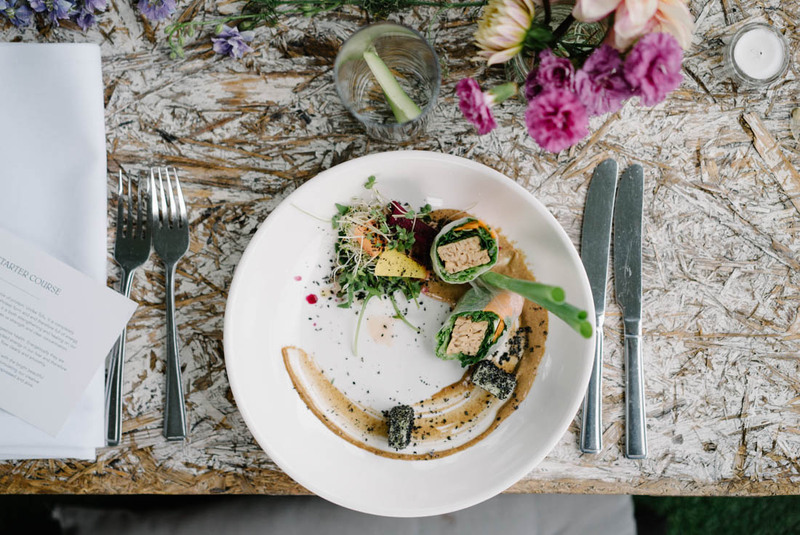 An Evening of Fine Dining was the first in what I hope and think will be a series of supper clubs focused on both the mind and the body, and of course gorgeous plant based vegan food. Nicky Clinch is a trained macrobiotic chef and counsellor who understands the healing properties of foods and believes in their energetic power. During the evening, along with each dish, we received cards which explained what properties the different components encompassed and how they effect us as we eat them, both with our eyes and our mouths. 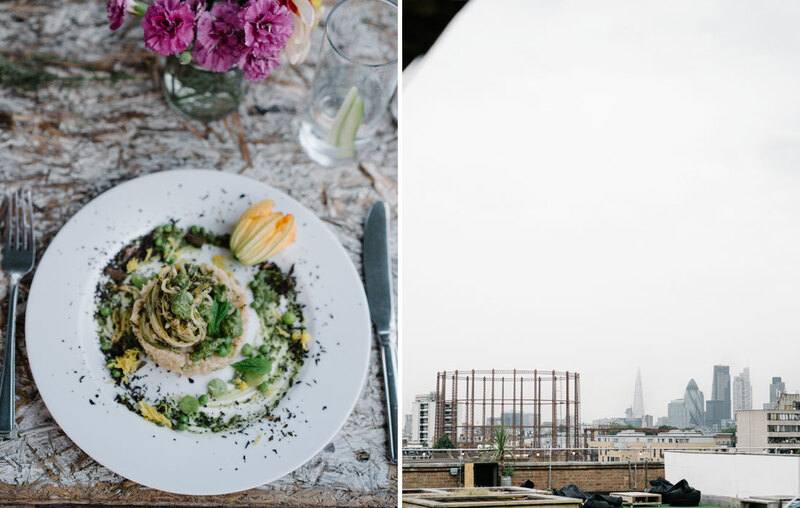 Although before sitting down at the beautifully set table on the rooftop at Netil360 we were invited to engage with a led meditation by The Well Garden. As we joined the practitioners on mats, with blankets to keep us warm and an awning sheltering us from the drizzle of a London summer, Nicky was preparing our meal. 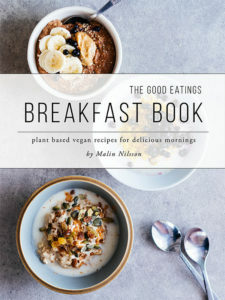 She believes that to be able to really enjoy, appreciate and digest food we need to slow down and come back into our bodies. 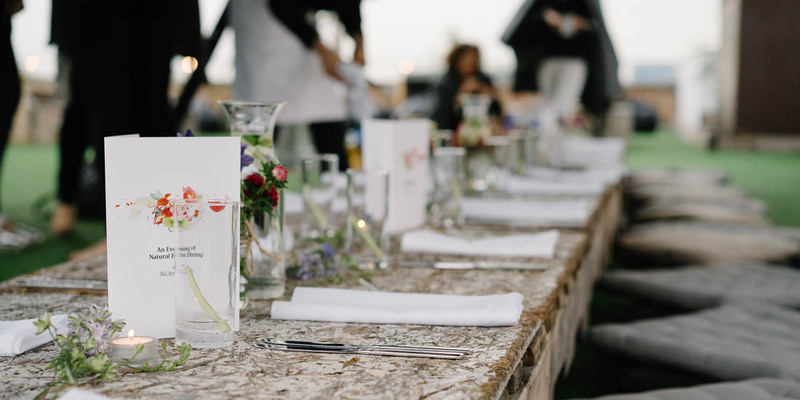 As many of the guests at the supper club had rushed over from work this made a lot of sense to me, and it seemed to make sense to the other guests as well. And who would say ‘no’ to a restful reset and some hands on bodywork anyway? After a summery strawberry iced tea for welcome mingling and roughly an hour of resetting ourselves with The Well Garden’s practitioners we enjoyed cucumber and mint cocktails (or mocktails) and sat down to eat. 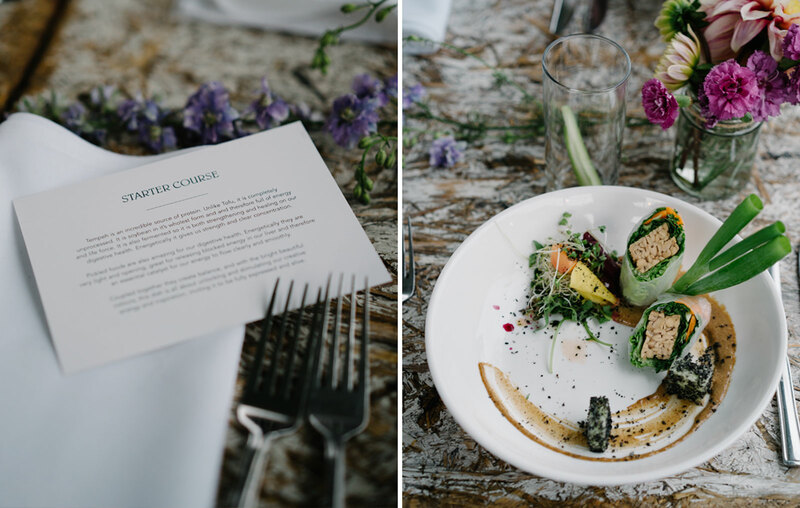 The first dish was tempeh summer rolls with an orange infused satay sauce, pickled beetroot and sprout salad and salted cucumber cubes in crushed black sesame. It was a feast for the eyes and the taste buds with complimentary flavours and gorgeous plating. 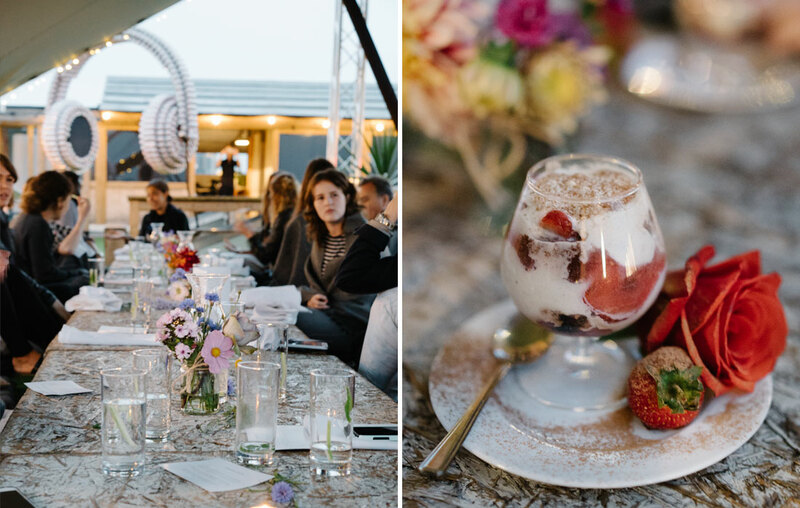 I’m glad I was there with my camera at hand because the beauty of the food at this event was something special, and something rarely found in vegan cuisine. 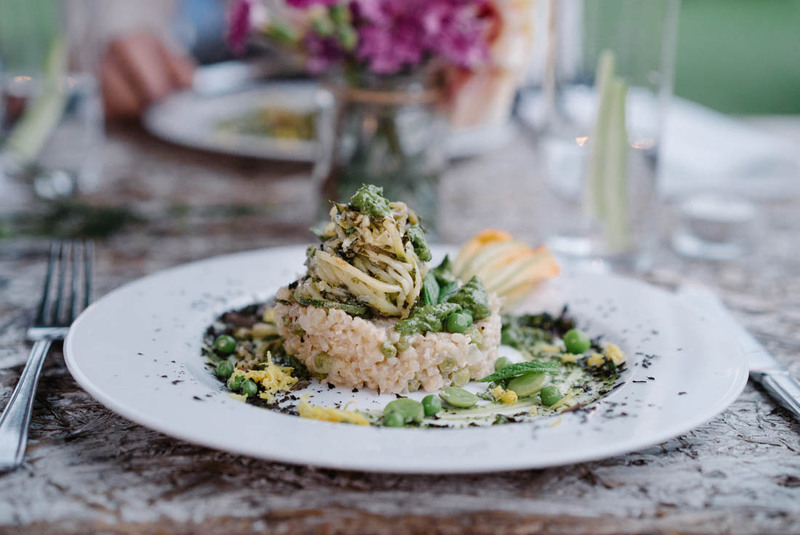 What followed was an equally stunning main course of a miso brown rice risotto with peas and broad beans served with a courgettie tower on top and a fresh herb and garlic pesto dotted around the pumpkin seed and wakame dusted plate. That was a long sentence but I didn’t want you to miss out on all the beautiful ingredients and carefully put together flavours. After the light and rainbow coloured starter this more hearty and earthy main was perfect. Later on in the evening Nicky explained that this line up was no coincidence, this is how she plans a meal. She considers the energy her food will give her guests through colours, textures and flavours and that way she can emotionally guide them through an evening with care through her food. To finish of our meal we were served a red velvet trifle with strawberries, berry coulis and cashew cream. It was simple and delicious, delivered with love and a rose. After I was thoroughly satisfied and enjoyed the digestive aid of a tea ceremony by Tiosk and a short talk about macrobiotics and Nicky herself. Find out more about Nicky Clinch and future events and courses here.